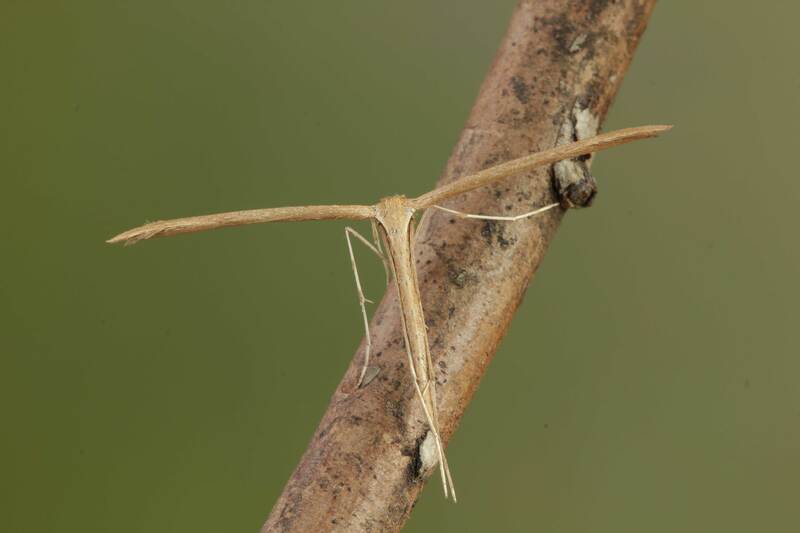 This species is a member of the plume family which is unique in the British Lepidoptera in resting with long very narrow wings held out at right angles from the body. All species look T-shaped, and none more so than the Common Plume. This is because its hind wings are rolled up and are normally completely invisible behind its forewings. Can be seen almost throughout the year as the adults hibernate, and what is possibly a second generation appears in summer. Flies at dusk, often comes indoors especially in autumn, and is often disturbed from rest in daytime. Adults feed on flowers, especially blossom including Ivy, and on soft fruit. The small leaves, flowers and seeds of Bindweeds.